So I was reading through this section and saw a lot of misinformation posted and thought I would share what I know from rebuilding T5's for 18 years now. When I first started, I was rebuilding/building 3 to 4 T5's a week, now it's down to 1 a week or so as the demand for T5's has deminished. First off, the V8 and 2.3L T5 share everything externally. The bearing retainer, cover, case, tailshaft housing and shifter all interchange. A steel bearing retainer from a fox V8 trans will fit a 2.3L trans(ask me how I know) and work easily, however, th 94 up will NOT fit, but can be modified to work. Secondly, the input shafts for various T5's will NOT INTERCHANGE. I say this because I also saw that being tossed around, taking a 2.3L input and tossing into a V8 trans will not work. absolutely, positively will not work. Here's why, the internal gear ratios come from the various tooth counts of each gear inside the transmission. The very first gear ratio is the input gear contacting the larger front gear on the countershaft(solid gear at the bottom of the trans), these are designed as pairs, so an input shaft out of a 2.3L with a 4.0 first gear will not interchange with a 3.35 V8 first gear trans. I say first gear trans because that's how much transmissions are identified, by their first gear ratio. Various manufacturers used different first gear ratios, different input shaft spline and pilot bearing diameters, different output shaft lengths, different tailshaft housing designs, speedo placements, bearing retainer sizes and lengths, so grabbing a T5 for the sake of it being a T5 is a waste of time as the only guaranteed parts that will interchange are the 1/2 slider and the 3/4 slider and the 5th slider. Everything else is propriatary for that particular vehicle manufacturers version of the T5. So saying, swap the input out and it'll work, is an incorrect statement. There were several versions of the 2.3L T5, with the largest difference being between the turbocoupe and the std n/a 2.3. The first gear ratios were different as well as the 2cd, 3rd ratios. A 94 up V6 T5 is essentially the same as a 94 up V8 T5, with the exception of the gear metalurgical composition and some teeth count discrepencies. The V6 trans utilizes the inferior 89 and earlier gear set, made of a weaker steel, and has the same 3.35 first gear, but a different tooth count on 2cd and 3rd even tho the ratios are similar. A 2.3L input shaft will not fit into these transmissions and work. It might bolt in, but it will whine and make one hell of a noise as it dies once power is applied to it, if it will turn over at all. The other difference is the V8 and V6 trans both share the same input shaft, albeit different in metalurgical composition, but the teeth count and length are the same. The bearing retainer is also the same and interchangable between the two transmissions(V8 and V6), but are longer than any fox style bearing retainer. The 94 up bearing retainer can be used on a fox body(both 2.3L and V8), by cutting approximately .650" off the end of the tube. I use a steel band saw to cut it off or have used a cut off wheel to do it as well, then just use a grinder to get it flat and remove any sharp edges with a wire wheel. It's a nice upgrade to any 4cyl or V8 unit from 92.5 and earlier. The case top, or shift cover as it's sometimes called, has changed over the years, but the one specific point I wanted to share was the sensor that uses a 7/8" wrench to remove it from the front of the cover. This was a neutral sensor that the factory was going to use for some purpose but never did anything with it. It can be unplugged or deleted by using a 91.5 and up shift cover. It will affect NOTHING on the vehicle. Everything will function as it did before deletion, and the computer will show it can't see the switch, but it will affect nothing as it uses the vss to determine whether the engine is driving or in neutral sitting still. I told a guy who installed remote starts that he could use that switch for manual trans mustangs to verify neutral for the failsafe on the remote start. He started using that back in the day with great results. I had to chuckle when I read that 2.3L T5's were hard to find, when I have an entire rack of them, with desperate guys stuffing them into their V8 cars and then trying to pawn them off to me as a V8 core when they finally come to buy a good V8 trans for their car. The good news is that most of the 2.3L trans I get in that have not been behind a V8, are easily rebuilt by replacing the blocker rings if the customer is smart enough to bring it in before it starts grinding into gear. I hope this helps shed some light on the T5 tech. If anyone has any questions, feel free to PM or post up here, I'll try to keep up with it and answer them. I also want to toss out there that in 98 I went 10.66 on a T5 I built, running in true street for the FFW races, I went to 4 of them that year, but that was the fastest I went, most were 10.6X and 10.7X. That was with the 2.95 gearset. Use the V8 bearing and race in the V8 steel bearing retainer. Easy, no. Simple fix, yes. Bearings run less than 20 bucks even if you overpay. I get them for less than 10, just shop around. You must reshim the input after you replace the bearing, as there are shim(s) under the race in the bearing retainer. shim it so the input is fairly secure, but may have a few thousandths wiggle to it, but def not so tight that the trans is hard to spin. Sometimes the original shim is all that's needed, but I'm putting it out there that you need to ensure it's correct before installing the trans. Also remember to tip the trans(tailshaft up) as you remove the input shaft so the needle bearings will not fall down into the case and they will stay inside the input where they belong. D&D in MI sells a great manual for rebuilding the T5. They also sell every T5 V8 part you could want or need. Hope this helps. Last edited by nxcoupe; March 12th, 2014 at 09:20 PM. the input shafts for various T5's will NOT INTERCHANGE. I say this because I also saw that being tossed around, taking a 2.3L input and tossing into a V8 trans will not work. So you are saying that you can't swap gears between various transmissions? For instance, you can't take a 1rst gear set from a 5.0 V-8 transmission and swap the parts with an SVO trans? 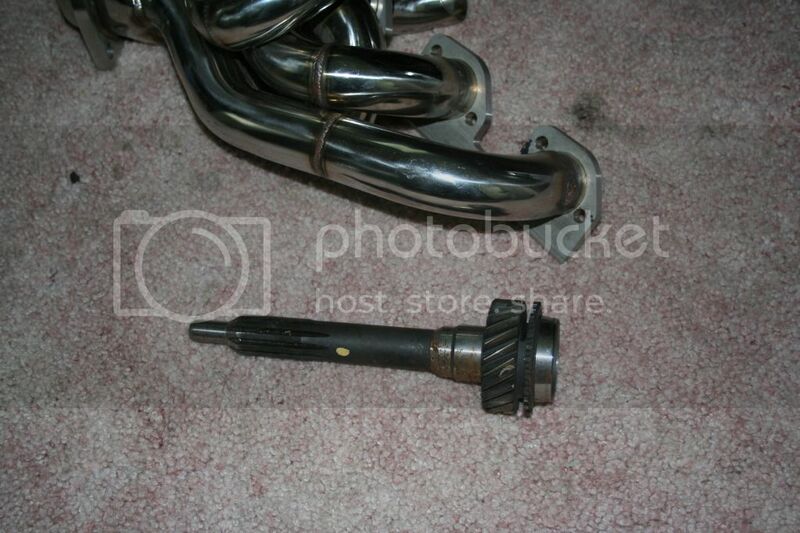 Here's a picture of the input shaft he's talking about. You can't swap parts between gear sets, yes. It's either all or nothing. If you take an input shaft from a 2.3 trans and put it into a 5.0 trans, unless the teeth count and diameter of the gear are exactly the same, it won't work. And I can't see any pictures you are posting as they are blocked on the internet I'm on. Is there enough spline depth on a SN-95 input shaft to cut off to 2.3 dimensions and still not bottom the clutch disk? I noticed that the 4 cyl shaft is longer then the V8 fox input shaft. I can't see any pictures you are posting as they are blocked on the internet I'm on. Oh, that's a bummer about the pictures. In any case, I posted a pic of a T-5 input shaft from a 5.0l Mustang, with the pilot shaft cut down to fit in an SVO gearbox. I swapped the 5.0 input shaft and gear recently (I would assume that it would be obvious to change both), into an SVO gear box for a 2.95 ratio in 1rst. I've done this a few times with different Mustangs and never suffered an issue, but from what you're telling me, the production tolerances are so bad, that it may cause issues, swapping between gear cases? I only bothered checking the first set that I ever did with plasti-gauge, it came out exactly like the original. Bummer, I just finally found the time to put the trans back in the car and I never checked the tolerance on it. I really don't want to pull it apart again. If you dont mind me asking OHC, why didnt you just swap Bell housings and have the input machined? The case is the same isnt it? Also what is the origin of the shorty header in that picture??? That thing looks nice. Do you have a full picture of it?? No, what I'm saying is that you must verify the diameter of the gear is the same, and the tooth count is the same. The gears don't interchange between gear sets. The point is, just because it's a T5 doesn't mean every other T5 gear will interchange. As to an example, I had a friend come up to get a 2.95 proshifted box done, I used to offer them. He came up, I assembled his output shaft, put it all together and after I put the thing together, it wouldn't turn over. Locked tight. I pulled it all back apart, checked every gear, counted every tooth on ever gear, checked the counter, made a few adjustments, put it back together, locked up again. Turns out that the first gear I had for his was indeed the proper gear count, but had a different part number, it was a 2.3 L first gear with the same tooth count, but when I swapped in the appropriate first gear, the trans was not locked up any more and worked perfectly. I hurled that problem first gear down the alley and have always checked part numbers and tooth count when assembling a trans. Just because it looks similar doesn't mean it will work, the teeth were a different dimension, causing the counterhaft to lock up with that first gear. And yes, the tolerances on these things are horrible, not like a TKO, they need to be shimmed correctly to keep things from wearing or breaking. Last edited by nxcoupe; March 12th, 2014 at 09:23 PM. I believe there is, but match up the 2.3 shaft to the V8 one, and see. I just used a fox body one, there might be a touch difference in length but I'll verify when I get a chance. If you don’t mind me asking OHC, why didn’t you just swap Bell housings and have the input machined? The case is the same isn’t it? In this particular case, I wanted to keep the gear ratios the same, with the exception of 1rst gear, so I swapped the gears from a 5.0 T-5 that I got from someone who had taken it apart. The Shorty header is something I have been picking away at slowly for a while now. It is made from 304 stainless steel and features 1-5/8” thick walled tubing. It has been a real pain to build. My intent was to build something that would just bolt in the place of the stock manifold, yet deliver decent flow for more mildly modified engines. This is my 3rd and final attempt; I’m running out of material to ruin. So far the test results have given an extra 10+ HP over a stock manifold. The test engine is stock except for a stage 1 cam and 2.5” exhaust on the back, with 19 lb. injectors. Total engine output is 132 HP @4950 RPM and 161 lb. ft. of torque @2950. The test car is equipped with a catalytic converter and it was my original intent to build a CARB compliant part. BTW the stock engine basedlined at 89 HP. This question is for nxcoupe, what sort of low cost upgrades can you recommend for the rest of us, in order to extend their reliability of the T-5. I'll take your failed attempts! I would love to have anything other than the stock manifold. It looks very nice, but would look nicer under my hood. The stock manifolds are a bit ugly that's for sure, but they actually work well. Does you 2.5 still have the stock manifold on it? It's a bit lighter than the older manifolds and with a little porting, can free up a couple of HP. The headers I'm working on are a pain to build and consume a lot of materials in the construction process. 304 stainless is very unforgiving to cutting tools. I'm using thick walled tubing for these, which at least is easy to weld, but variations on bend radii have led to many miss-calculated cuts. The biggest benefit to using 304, is its corrosion resitance. The manifold on it is cracked. I do like the look of your 304 tubes, if you don't have any use for them, let me know. Well, my best recomendation is to replace blocker rings regularly in any car that sees a lot of abuse, shifting fast, holding pedal to the floor during shifts, etc. that's the secret to my T5 lasting behind about 450 hp. As for anything to strengthen it, well you did it by putting V8 internals into your trans. That's the one thing I can say will improve the longevity of a T5. The input or pilot bearing will need to be addressed as we've discussed, before a V8 trans will work. I joined the forum to ask you a few questions since I am in a bit of a predicament. What I have is a 65 Mustang with a 289, an AOD that I am converting to a manual. In my local area, T-5s are made of gold and it is hard to find one. Since my car is not a daily driver and it is just a non-hipo 289, I found a T-5 from a 2.3 for $200 local. I also picked up the bellhousing, clutch, flywheel, for $75 from a 5.0 I now the 2.3L t-5s have a stupid low first gear and they are not that strong, but the conversion is not a small job and I plan to switch to the correct trans later. I ended buying a T-5 from a 99 mustang V-6 which I was told buy the owner that it came from a 95 Cobra. That brings up 2 problems. 1 is the bellhousing and the other is the electric speedo. Getting my money back is not going to happen. From what I have read, the bellhousing I need is from a 94-95 5.0. They too are apparently made of gold. I was discussing this with someone and they said I could potential swap input shafts from a 93 or earlier T-5 as long as the same gear. This would allow me to use the 93 and earlier bellhousing. The speedo gear work around from what I am piecing together is swap the tail housing and modify the output shaft to accept the gear. I was reading a website where a guy swapped tailhousings to relocate the shifter. It required him to move the speedo gear. I can't find that link or I would post it. what do I need exactly for swapping a 2.3 t-5 to v-8 specs? A 5.0 bellhousing, and an adapter plate for the input shaft, maybe more, someone else should know more. But the 2.3 t-5 has shorter gears than the 5.0, so if you have short gears then first might be next to useless. A 2.3 t-5 would be much harder to find than a 5.0, possibly more expensive due to supply/demand. Bellhousing bolt patterns are the same between V8 and 2.3. My V8 trans bolted right into my 2.3L bell, the difference is in the diameter of the pilot bearing end of the input shaft. I had it ground down to the 2.3L diameter and it worked perfectly. To answer your question, you'd need a gear set out of a V8, the input(modified as I mentioned), V8 countershaft, V8 first, second and third gear, and reuse your 5th gear set as long as it is the same as the V8 unit. I'll have to look at a set at the shop to verify, but the last couple of 2.3L trans I pulled apart had the same 5th gears in them as a V8. I'll post those numbers as I get a chance. Yes, just use a 93 or earlier V8 input shaft and it will fix your issue, also cut the amount off of the bearing retainer that I mentioned in a post above. Sorry to hear about the liar of a seller you encountered, but that seems to have become rampant here lately. I have come to not believe anything anyone says about their car unless I can verify it concretely. My latest was being told an engine was rebuilt only to find out it was a pos 250k mile 302. Nice. I have an 89 2.3LX with a T5 that started giving me some trouble shifting into reverse when the car was running. So I replaced the clutch disk, pressure plate, throwout bearing, and pilot bearing. I got the transmission back in the car and one day while driving I wasn't able to downshift anymore. I'm looking to fix the issue but would like to know what to fix before I use the "throw money @ it troubleshooting" method. I talked to my dad who is by no means an expert, he said it sounds like my synchro rings are in need of replacement. I called a local transmission shop and explained the following, they said to replace my input bearing. Your trans shop doesn't sound like they do many manuals or your misunderstood them. it could be the pilot bearing is what they were alluding too, but it sounds more like a clutch engagement issue, but I'm kind of driving blind here because the description of the problem"I wasn't able to downshift anymore" doesn't tell me much. Was it grinding? You pushed in the clutch and it just would not go in at all? Did you shut off engine and stop the car and see if it would go into gear then? Could need rebuilt, but unfortunately, there are no aftermarket parts for the 2.3's that I am aware of. Some parts house somewhere might be able to get them, but I'm sure they will be pricey. Good luck.